I'm a bit concerned that the tip will damage the fiberglass as the anchor is hauled over the roller. I have been using a Danforth Deepset version of the CQR that came with the boat when I bought it. I run 50' of chain and 5/8" 3 strand nylon. So much depends on what sort of bottom you anchor in and he usual depth. Where do you cruise to? 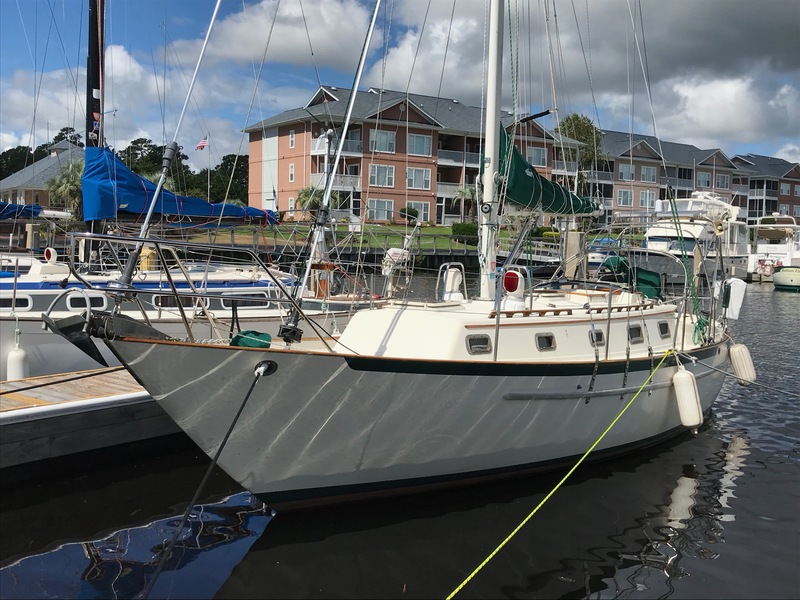 1988 Olson 34, by Ericson Yachts. I'm using the Rocna 15... works fine... just be careful as you are hauling up the last little bit and you'll be fine. I'm based in Mid-coast Maine where I cruise with my family. Lots of snug anchorages with mixed bottoms. Only time I have dragged was in very soft mud. I see a lot of posts on this forum about 44lb and even 60 lb anchors. Seems pretty clear from the Rocna literature that the 15 (33 lb) model is the recommended size for the 34. Is there a compelling reason to upsize beyond the recommendations that must have safety factors built in? Maine is my cruising grounds too. I was worried about a heavier anchor because, like you, I usually haul it up by hand. I recently switched to mostly chain (150ft) plus rope rode (200ft) and I'm pretty happy. Thanks for the input. I will keep an eye out for you in home waters! Hey, I have a Fisher 32 not a PSC, bought a Rocna 15 kg but found that it didn't particularly like softish mud and would sometimes slowly drag, as well as bring up a lot of mud when hauled. I gave up and replaced it with a sarca excell and have been very happy since. Check out video's of anchors setting by Steve of SV Panope, some interesting footage there. We carry a 20 kg Rocna and a 20 kg Bruce on the bow. The boat has a ding plate below the anchors that you can see in the photo. The Rocna gets used. The Bruce is the spare. The Rocna has 137 ft of 5/16 in BBB and 170 ft of 5/8 in nylon. On the stern is a FX16 Fortress with 25 ft of 5/16 in BBB and 250 ft of 1/2 in nylon. Last edited by wsmurdoch; 19 Hours Ago at 09:43 PM. We also have a Rocna 15, with 150 ft of chain. Hasn't been a problem, although when hauling up the anchor, the shaft can get caught in the furler. Bill, how do you stow your Fortress anchor on the stern? I have one also, but haven't found a convenient way to stow it (except disassembled...). 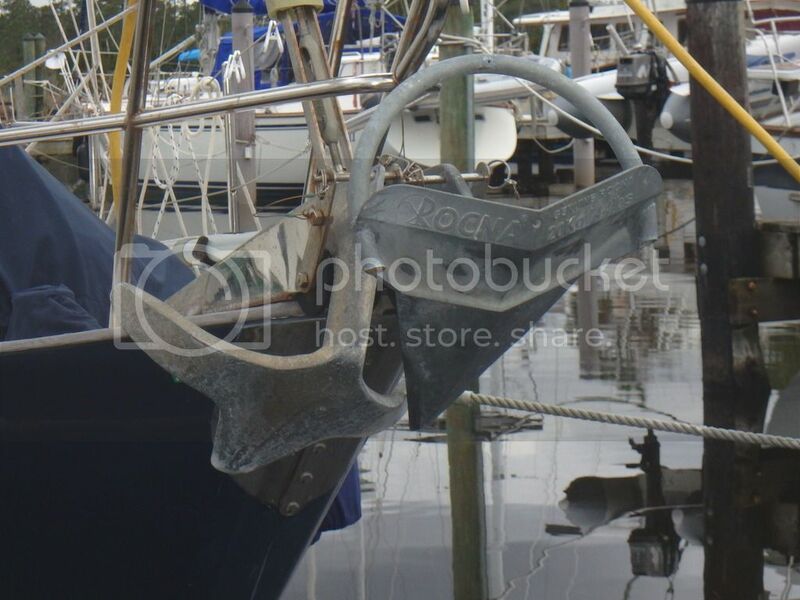 We have a Rocna 15 as our primary anchor on our 1990 34 PSC and it fits on the standard bow roller like it was made for it. One of the best investments I ever bought for our boat. Sets quickly and securely. We use 3/8" BBB all chain rode with a snubber setup.